Both posters are the amazing work of designer Sean Dowling. 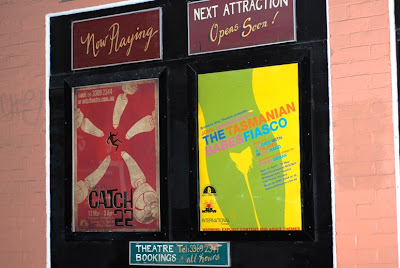 The Wah's production of Catch 22 is now playing, and The Tasmanian Babes Fiasco opens 10 April. The Wah and I, side by side. 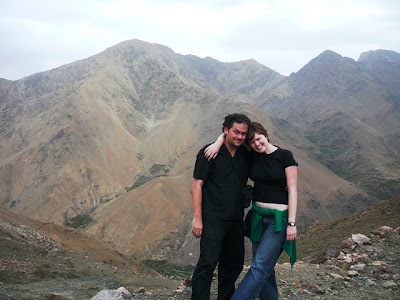 Imlil, High Atlas Mountains, Morocco. What he said. I think. Love that pic! Both your facial expressions speak volumes. Looking forward to Tassie Babes, and absolutely LOVE that photo. You pair are gorgeous. Aww, so cute. Can't wait for Tassie Babes either. You realise he can't possibly be good enough to deserve you. loved catch 22 and looking forward to Tassie Babes.